“Companies that excel at customer experience grow revenues 4-8% above the market.” – Bain & Company. The role of AI is going to be incremental in the CX battlefield. And this is evident from the investment large and small-sized enterprises are making in the technology. In a recent Gartner report –“by 2020, AI will be a top five investment priority for more than 30 percent of CIOs”. However, amidst these promising claims, the question – how AI will transform CX still remains a mystery. The attempt of this article is therefore to highlight 4 ways in which enterprises can implement AI to render positive customer experience to their customers. Before we get on with the discussion on how AI-powered bots will transform the customer service space, it’s important to clear the air about a frequently asked question – Will Chatbots replace human agents? The answer to this question is a resounding no. Front-end Chatbots are not meant to replace human agents; instead, they are deployed to enhance their productivity. With bots, enterprises have to no longer fear about chat abandonment. Chatbots are available 24*7. It can handle mundane tasks efficiently and according to Juniper research – Chatbot conversations is expected to deliver $8 billion in cost-savings by 2022. In the era of social media, a deep understanding of the customer’s voice is more relevant than ever before. While positive customer experience narrative on social media is good news, a public dismissal can hurt the image of the brand. According to a Gartner report- “84% of millennials say that user-generated content (UGC) has at least some influence on what they buy”. To avoid any business loss due to negative online review, the key is to timely capture the sentiment of the customer. This can be done through sentiment analysis of textual and voice data. AI technologies and predictive model intelligently picks up aggravated excerpts from customer conversation which may be a likely source of discontent or irate. Customer service agents can be duly alerted of all such instances to facilitate a customized solution to the problem. Sentiment analysis helps in delivering unmitigated customer experience and prevents businesses to lose customers from unpleasant customer service or product. There is a strong link between agent satisfaction and customer experience. A happy agent will be proactive in addressing the needs of the customer. Burnout and customer wrath are primary reasons why employees are dissatisfied. However, now thanks to AI driven technologies like chatbots, executive dashboard, sentiment analysis etc. agents are empowered to service the customers better. Employee satisfaction is also important to reduce attrition rate and to get back the ROI on training and development. The power of big data and machine learning has allowed the development of AI technology as a key decision-making metric. In a competitive world, business decisions cannot be made on guts and intuition. Rather, decisions should be backed by data. So, whether is product review or customer service processes, AI enables businesses to make informed decisions. 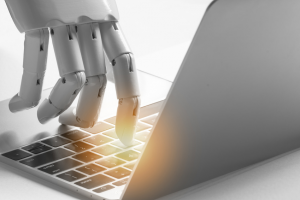 In a customer service setup, machine learning will study customer feedback or workflow bottlenecks that are negatively impacting customer experience (CX). By identifying the exact cause or source of the problem, enterprises can make business decisions that are logical and scientific. “Great customer experiences don’t happen by accident” – Forrester. This statement is true. Unless companies develop a customer centric-culture and invest in CX strategies, it is impossible to offer superior customer experience to one’s customers. At the same time, investing in right technology that improves CX across touchpoints is relevant. Considering the on-going trends and market analysis, AI is definitely that technology enterprises must adopt to win the CX game. Kamna is a CX expert and contributor at Ameyo.com, one of the leading customer experience solution providers. Her expertise lies in tracking and analyzing trends in the CX and customer service domain and assist businesses to develop and understand key strategies through her writing. This entry was posted in Articles and tagged AI, artificial intelligence, customer experience, CX. Bookmark the permalink. I will also implement these ways Transform Customer Experience. Great post!! AI is transforming almost every sector in providing better customer experience.